Enrico Ramirez-Ruiz, professor and chair of astronomy and astrophysics at UC Santa Cruz, has been elected a Fellow of the American Physical Society (APS) in recognition of his outstanding contributions to physics. A theoretical astrophysicist, Ramirez-Ruiz is developing the conceptual framework needed to understand the violent and capricious nature of the universe. 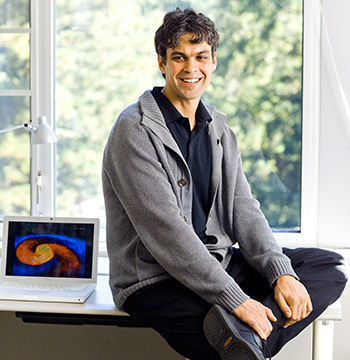 He uses computer simulations to explore transient phenomena such as collisions, mergers, and disruptions of stars—especially those involving compact objects like black holes, neutron stars, and white dwarfs. Both black holes and neutron stars can generate copious gravitational waves when they collide and merge, and simulations of such encounters play an essential role in the ongoing efforts to detect gravitational waves. Over the past decade, Ramirez-Ruiz has developed a cutting-edge research program in this area, pushing the frontiers of this exciting new field. Ramirez-Ruiz also established the Lamat program, which gives undergraduate students, many of them from regional community colleges, the opportunity to work with UCSC faculty and graduate students on computational astrophysics projects. As the director of the Lamat program, Ramirez-Ruiz works vigorously to support the promotion and retention of women and underrepresented minorities in STEM fields (science, technology, engineering, and mathematics). The citation from APS recognizes Ramirez-Ruiz "for contributions to the understanding of transient phenomena such as collisions, mergers, and disruptions of stars with novel computer simulations, and his work supporting promotion and retention of women and underrepresented minorities in science." Ramirez-Ruiz earned a B.S. in physics at the Universidad Nacional Autonoma de Mexico and a Ph.D. in astronomy and astrophysics at the University of Cambridge (U.K.). Since joining the UC Santa Cruz faculty in 2007, he has earned numerous awards and honors, including a Packard Fellowship, a Radcliffe Fellowship, a Niels Bohr Professorship from the Danish National Research Foundation, and the 2017 Edward A. Bouchet Award from the APS. Election as an APS Fellow is a distinct honor signifying recognition by one's professional peers. Each year, elected fellows number no more than one-half of one percent of APS membership. APS represents over 50,000 members, including physicists in academia, national laboratories, and industry in the United States and throughout the world.